Now here’s something a little out of the box, stylish and very modern. Honda has just given Australia the all-new Civic 1.5 Turbo sedan to enjoy. Well, it looks sedan but is also Fastback – you make your own mind up – but whatever you call it, it looks the goods, performs very well, offers space for the family and goes a long way to converting the CVT knockers. Boldly different, Honda’s latest 1.5 Turbo and 1.8-litre VTEC cars set them apart from a Mazda 3 and Toyota Corolla equivalent. The outgoing model had a little trouble attracting the buyers with its slightly mundane appearance. However, you would find it hard to fault Honda’s completion on this one. The low-slung fastback design looks striking and gets the looks it deserves. The rear-end of the new Honda Civic looks way better than the Mazda 3, and way more practical, too. A nice set of 17-inch alloys, fog lamps, dual exhausts, chrome door handles, boot spoiler, LED headlamps, and an optional shark-fin aerial run through the dynamic Civic 1.5 Turbo design. 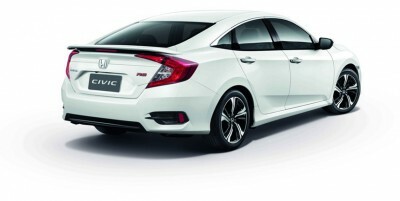 Grabbing your attention, the new Honda Civic is long and quickly makes a classy statement. It has dimensions which set it amongst the bigger cars in its class, and being 4630 mm long and 1799 mm wide it makes the new Civic 105 mm longer and 44 mm broader than the sedan it supersedes. It’s also lower by almost 20 mm and this reduction adds to the Civic’s sleeker looks. For your information, the new Civic is also longer than both the Mazda 3 and Corolla it competes directly against. Hop inside, and the modern interior is well-educated and practical. An electronic speedo adds to the driving appeal and sportiness that the 1.5 Turbo model is all about. If you like your white-on-black analogue speedometer, then you’ll need to opt for the 1.8-litre base Civic models for that. The large binnacle houses a central rev meter and digital speedo. The panel itself is digital with customisable menus, featuring a red theme for the Turbo’s greater individualism. Honda’s familiar touchscreen head unit is found in the car’s central dash. Air conditioning controls drive a dual-zone climate control arrangement so that front and rear occupants can choose their own temperature. You sit, what feels like, quite low down, and this adds to the car’s sporty driving flavour; I like it. You start the engine by pressing the start button which stays illuminated in red when the engine is going. Luxury features and technology items include things like Apple carplay and Android Auto. Just connect your phone, and the car system will take over the music and communication connections. Inbuilt cameras help you to check your surroundings – great for backing and for all those city tight spots. Some of the higher-end models (LX) get Lane Departure warning and Collision Avoidance systems. Adaptive cruise control is also available. All the necessary adaptive and passive safety features are standard on all Honda Civic 1.5 Turbo models, making them as safe as ever. Being typically Honda, there is very good leg and shoulder room. They have the cabin space sorted, and the Honda Civic 1.5 Turbo sedan is roomy for its class. There are heaps of areas for storage including cup-holders; and power outlets, USB and HDMI ports are standard features, too. For those who like to know about the engine under the bonnet, the 1.5 litre VTEC Turbo engine produces plenty of punch and fast acceleration. With the motor getting the power down via a smooth CVT unit, the acceleration is deceptively quick. The engine produces 127 kW at 6500 rpm and 220 Nm of torque from 1700-to-5500 rpm. Though some previous CVT units haven’t been that sporty to drive, Honda’s CVT transforms the way you approach these seamless drives. It’s no Type-R, but you can get to the legal open road limit in a little over eight seconds. As you would expect, the Honda Civic 1.5 Turbo is fuel efficient – really shining in this area. Handling is nice and accurate, while the suspension soaks up the bumps well – being slightly firmer for sportier road-holding. When battling it out in this tightly fought segment, the Honda Civic 1.5 Turbo excels. The new Honda Civic 1.5 Turbo is a great all-rounder. For any more information on the Honda Civic 1.5 Turbo or, for that matter, any other new car, contact one of our friendly consultants on 1300 303 181. If you’d like some fleet discount pricing (yes even for private buyers! ), we can submit vehicle quote requests out to our national network of Honda dealers and come back with pricing within 24 hours. Private Fleet – car buying made easy!